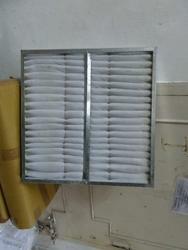 We supply various types of pre filters like air handling filters, Chemical Air Filters etc, for variety of applications. This SEPAR unit [SWK2000/10] is a 10 Liters Per Minute unit. The max fuel that can be handled by this unit is 10 LPM. Normally the Fuel Pump sends around 5 to 6 times the consumption to the engine. The unused fuel return through the back flow line. Often the fuel flowing back is used to cool the engine. "VENT" Filter provides high-efficiency ASHRAE air filtration performance in a compact, supported media design. The Rigid Cell Filters are designed for use as secondary filters in areas such as a Pharmaceuticals, Laboratories, Hospitals or as Pre-Filter to HEPA filters. Length:0-5" , 5"-10" , 10"-15" , 15"-20", 20"-25" , >25"
Diameter:0-1" , 1"-2" , 2"-3" , 3"-4" , >4"
Pre Filters for best suitable for all HVAC applications and as a Pre Filters before using final HEPA & Fine Filters. These ensure less dust load on Fine/HEPA Filters. Air Handling Units, Package Units, Air Washers & General Pre / Fine Filtration. Microglass fiber filter is manufactured from 100% borosilicate glass & are often used as a prefilter. They are prepared from a depth type media (borosilicate glass) a random matrix of material which may or may not contain a binder .These filters trap particles within the matrix & therefore have a high loading capacity. We offer supreme quality Pre Filters which is used to filter larger dust particles (having size less than 10 micron) rubber, sand, dirt, etc from the atmospheric air. 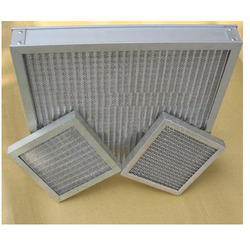 We are remarkable entity, involved in offering superior quality gamut of HEPA Pre Filter to our respected customers. Our vendors’ adept professionals design this filter by making use of high grade material and ultra modern machines. Offered filter is widely known in the market for its several indispensable features.